This may not matter for much folk, but is a good feeling inside for myself. A personal milestone, so to speak. 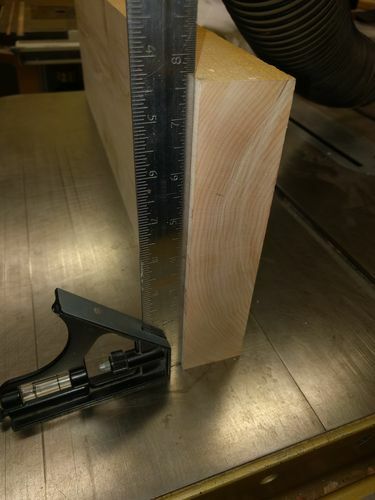 I made my first true 90 degree board with the use of my Stanley #8 and Stanley #5 1/2. I verified with my Veritas winding sticks (I gave up on making my own because my vice to hold thin objects is horrible) and to double check, I used my table saw cast iron table top and a square. Then I used my saw bench to rip down 2 boards of 48” length (these are 2”x12” boards ripped down the middle to give that quarter sawn aspect). I think I better stop smoking and exercise some arm strength routines because I had to stop a good 3 or 4 times. 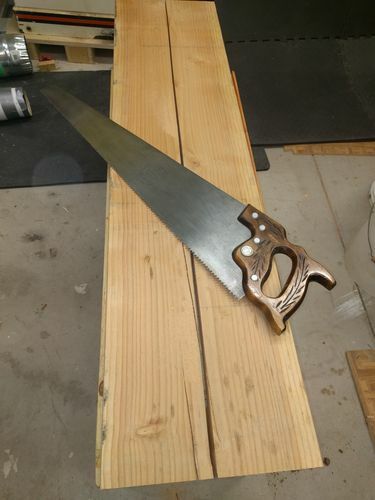 I’ll not use all 48” length (I am shooting for 36 or 32” joinery table top) but doesn’t hurt to gain practice hand saw ripping and following the line, which I’m getting good at. If I’m looking at your picture correctly, then this is the first time I’ve ever seen a shoulder vise like yours. How well does it work? I assume the guides to either side of the screw keep the jaw square, can they be removed if you need the jaw to hold work that is not rectangular (maybe not the best description, something that isn’t square and flat, maybe tapered or some more complex shape)? Holt, this is a Levrand bench, a Danish wood working school bench. Now that you mentioned it, I never gave it thought about the double pinned chop :) I’ve only seen single screw (like Lake Erie Woodworks wooden screw) on a chop. Yes, the jaw stays square and cannot be removed. I’m sure it’s possible (but not too easy) to clamp down out of square items. 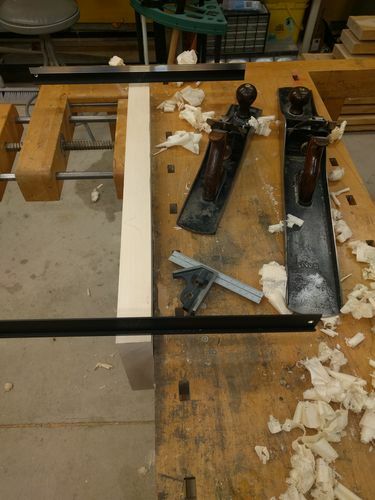 I know the out of square clamping is one of the “virtues” of the Scandinavian style Shoulder vise, but I think I like your’s better. Seems like i could avoid some of those third hand needed situations. Going to do some research on Levrand. Thanks for the info!!! paid $200 for it at a local auction. would of been $75 if not for this one guy that would not give up. grr…. It is a big deal to perfect your hand skills and I think all woodworkers can relate to how you feel about it.